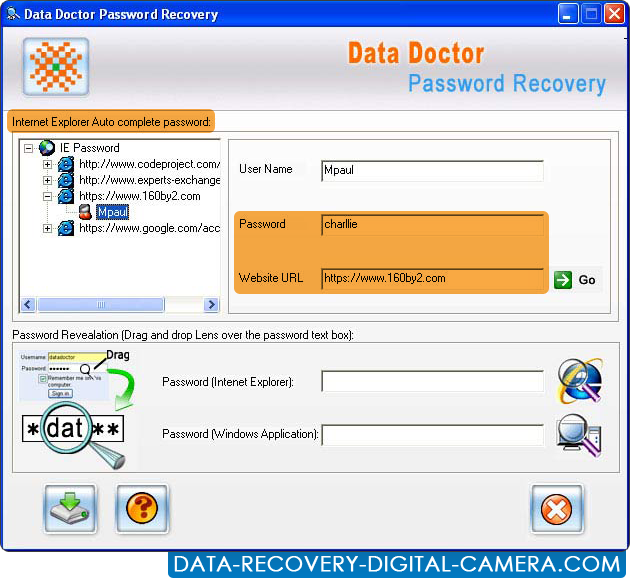 Internet Explorer Password Recovery Software recovers all lost or forgotten passwords saved on IE for E-mail accounts (Yahoo, Gmail, MSN, Rediffmail, indiatimes etc), Online shopping accounts, Magazine subscription and other password protected Windows application including Database password, Administrator password and AutoComplete field password. Password unmask application recovers all asterisks (******) character password with support to multilingual passwords. Easy to use software facilities to save recovered password at user specified location for future reference. Password recovery tool unhide hidden asterisks password and protect your important password ever entered on your computer PC. The recovery wizard supports all major version of internet explorer and provides easy way to show the password instantly. Recovers lost and forgotten password of E-mail ids, Newsgroup account, Chat accounts, Online shopping and other Internet mail account services. Recovery software unmasks password behind the asterisk characters. Software restores all type of internet explorer saved passwords including Auto complete password, FTP password and IE auto form saved password. Software facilitates to save identity password for both Admin and Administration users. Recovery software supports all type of internet explorer version.